Last week on Twitter, we asked about the sort of In Development content that you want to see while we’re working on the game. This sort of content is actually a lot of fun to put together, and internally, it’s our favorite kind of content to be presented with, so it just seems like a natural fit for us! This comes with it’s own difficulties though, because it’s a complicated form of content. We don’t want to give away too much about the game itself, but we also want to let you dig into the nitty-gritty with us. 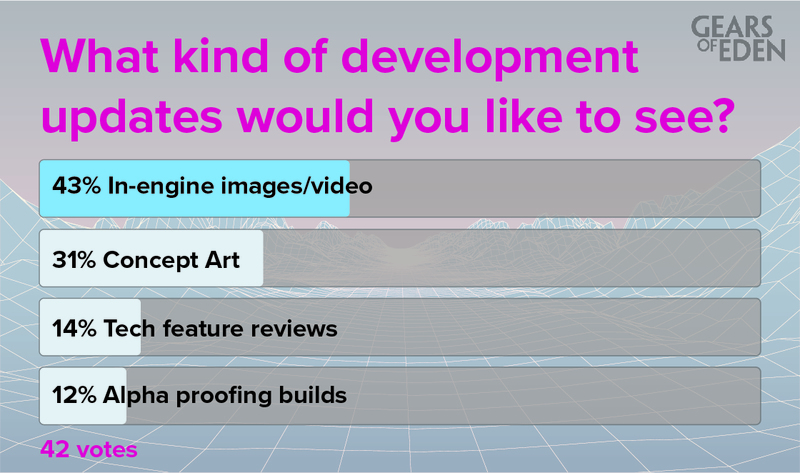 We had four options for last week’s poll; Concept art, In-engine images/videos, Tech feature reviews, and Alpha proofing builds. When the poll ended last night, we found that In-engine images/videos and Concept art blew the other two out of the water! This is good for a couple reasons; first of all, it confirms that we’re going the right direction with our social media campaign. More importantly though, it helps us know in which directions we should be expanding. We believe developing our “voice” is massively important to the success of Gears of Eden, so we’re always working on it! We also want you to know we are listening to you! So, based on your feedback, we’ve added a new media section to our website where will start collection screenshots and video. Check it out! This week’s poll is about crowdfunding rewards! With indie game development, extra funding is always appreciated, but we also want to make sure that, in the moment, the donation feels worth it to you. Be sure to cast your vote!